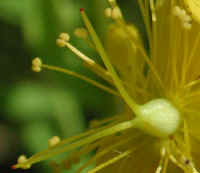 (St. Johnswort, Common (Hypericum perforatum) - 01) There are approximately 35 known species of St. Johnswort in the United States, most of which are in the East. 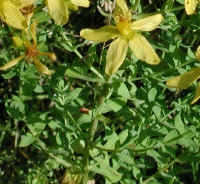 We believe this one is the common St. Johnswort, which grows in height from 1 to 2-1/2 feet. 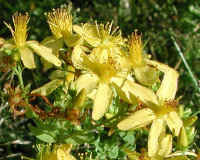 (St. Johnswort, Common (Hypericum perforatum) - 01a) One of the characteristics of the St. Johnswort is that the erect main stem most often has opposite growing branches, particularly near the top of the plant. The numerous oblong leaves also grow opposite one another. (St. Johnswort, Common (Hypericum perforatum) - 01b) The five petaled flowers of the St. Johnswort each measure about 3/4 of an inch in diameter. There are usually several flowers growing or developing in a cyme at the end of the branches and stem. As an example, on the left side of the photo is a branch with one open flower and several buds. (St. Johnswort, Common (Hypericum perforatum) - 02) The St. Johnswort flowers have one pistil with three styles and numerous stamens. The edges of the petals have small black dots. 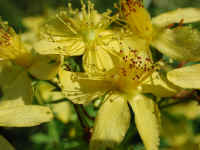 (St. Johnswort, Common (Hypericum perforatum) - 02a) A native of Asia, St. Johnswort was imported to the United States by European emigrants, some of whom used to collect the plants on St. John's Eve, June 24th, and hang them on their doors to ward off evil spirits. 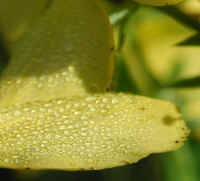 The dew, as shown in this photo, was collected in the morning of St. John's Day because it was believed that it was a good eye lotion. (St. Johnswort, Common (Hypericum perforatum) - 03) This photo affords us a closer look at the St. Johnswort flowers with their five petals, pistil, and numerous stamens. 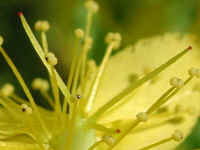 (St. Johnswort, Common (Hypericum perforatum) - 03a) We find the intricate detail of God's creation to be amazing. 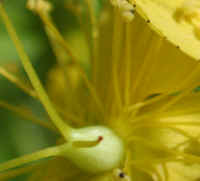 In this bee's eye view of the center of the St. Johnswort flower, we can see the three styles of the pistil emanating from the ovary and reaching out among the numerous stamens to ensure pollination. One style is reaching out in the 10:30 position, another in the 2:00 position, and the third in the 5:00 position of this photo. (St. Johnswort, Common (Hypericum perforatum) - 03b) In this close up view of another St. Johnswort flower, we noted that there appear to be only 2 styles in the pistil, but what may be a third style appears to be coming out in the 4:00 position. (St. Johnswort, Common (Hypericum perforatum) - 04) In this bee's eye view we can clearly see the three styles of the pistil growing from the ovary (lower left of photo). In the upper right of the photo, we get a good look at the black dots along the edge of the petal. The literature didn't identify the composition of these black dots; but the black dots on the leaves contain oil, which we suspect these do, too. The oil was extracted for healing wounds and skin irritations. The flowers and seeds were boiled into a tea to help heal urinary problems.